Today, I want to share with you another great recipe for a healthy dessert, and one of my fondest memories. As a child, every summer, growing up in the Russian countryside, I used to eat tons of fresh strawberries picked from my parents’ garden. We made a dessert of mashed strawberries pure and sugar. It was my favorite treat. Very simple, just sweetened mashed strawberries. Back then, I wasn’t thinking of what is healthy or not. Now I am cautious about my health, and avoid cane sugar in my diet. As in my childhood days, I still make strawberry pure every summer and enjoy it, but without sugar or using only healthy natural sweeteners. Those simple memories are the inspiration for this recipe! You need only 2 ingredients (*) and It is super easy to make. And most important, it’s really delicious! When served in beautiful glassware, you will impress guests and family with its colorful presentation. At times, great recipes are the ones prepared in a few minutes. This one is extremely convenient when you crave for something sweet and have nothing but a pack of strawberries or any berries in the house. I used organic strawberries from a local farmers’ market that were really sweet. That’s why I didn’t add any sweeteners. Blend strawberries until smooth. Pour the Strawberry pure into dessert or wine glasses. Place fresh blueberries on top. *If you got strawberries that aren’t sweet enough, use raw honey (if you are not on a 100% vegan diet), coconut sugar, coconut nectar or a little bit of date paste. Use your creativity and your favorite food preferences to modify this basic parfait recipe, and take it to the next level. You can add whole nuts, nut butters, chia seeds, raw date caramel (see the recipe on my first blog post). You can make a layer made with blended coconut cream, cashews & berries or cacao powder. You can use beautiful exotic fruits (ex. Dragon fruit) cacao nibs, shredded coconut, citrus zest as decoration. You can add super-food powders and even plant based protein powders. There are so many options! I think of this recipe as a base for more complex vegan parfait recipes. We all have different tastes and are creative in our own unique way. 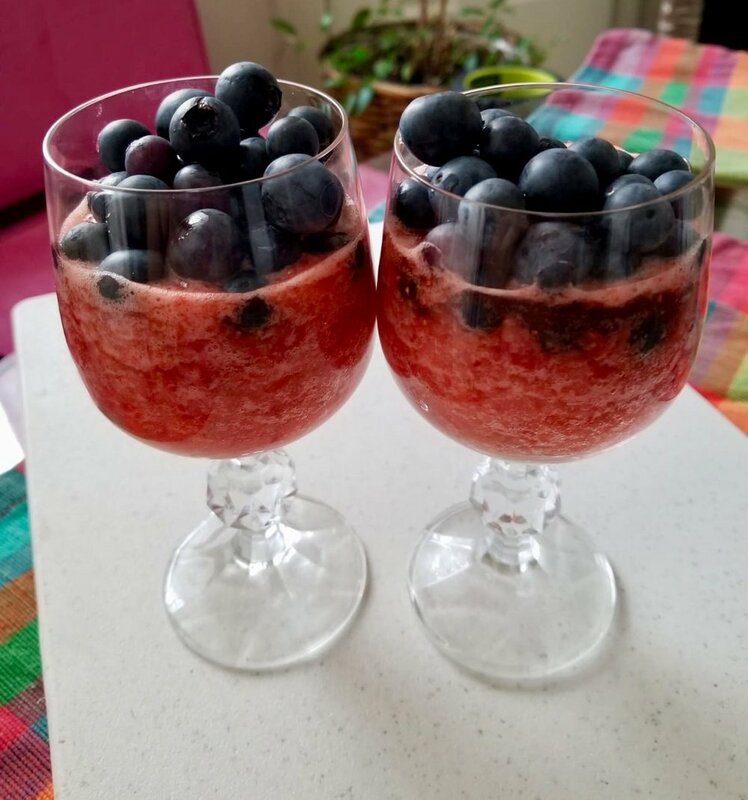 Please feel free to share your experiences on making quick healthy desserts. I’ll be happy to hear your feedback and exchange some healthy tips.